Are you ready to order ready mix concrete? If you think so, then think twice. You could be ordering the wrong mix design, reducing your revenues or offering a product that is not the ideal concrete mix design. Here we have prepared a list of productive tips that will assist you before ordering ready-mix concrete. One of the most important factors before ordering ready-mix concrete is knowing the required compressive strength. Typically, reinforced concrete ranging between 3,500 to 4,000 psi is used on footing and slabs on grade; between 3,500 to 5,000 psi on suspended slabs, beams and girders; and walls and columns normally require between 3,000 to 5,000 psi. When non-reinforced concrete is used different strengths will be required. If you are using it on footings and walls, a concrete strength of 2,500 psi could be enough while between 4,000 to 5,000 psi is needed for pavements. Outdoor concrete used on home improvements should be ordered with a strength ranging from 3,500 to 4,500 psi. The maximum coarse aggregate must also be specified when ordering ready-mix concrete. If you use larger coarse aggregate in a cross-section where the steel ratio is high, then you could be in for big problems due to honeycombing. The maximum size coarse aggregate ordered must be determined by the American Concrete Institute Standard (ACI) and depends on the spacing of reinforcing steel, inside form dimensions and available aggregates. Maximum aggregate shall not exceed 1/5 the narrowest inside form dimension and shall not be greater than ¾ the spacing between re-bars. Normally, the structural engineer will provide guidance and direction in regards to the aggregate sizing. Ready mix concrete is normally ordered by cubic yards or cubic meters. The typical truck can deliver between 9 to 11 cubic yards maximum capacity although lower amounts can also be ordered, you will be paying extra for the remaining capacity of the truck not used. 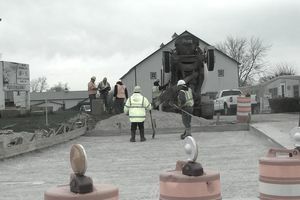 The amount of concrete ordered will also depend on where it will be placed and the form used. Always allow for some wasted concrete, which will normally vary between 5 to 10 percent of additional concrete. For a rectangular placing area, multiply length times width times thickness, in feet, and divide it by 27. That amount will be the necessary cubic yards of concrete needed. When using a cylindrical shape, such as a column, measure its height, multiply by 3.14, then by the square of the cylindrical radius, and then divide it by 27. Remember to also know if you are using an admixture, specify how far the job site is from the batch plant, the arrival time of the concrete that you are requesting, the desired spacing of concrete trucks, specify if you need any fiber or plasticizer, how the concrete is going to be placed (tailgate, pump, wheelbarrow, etc. ), air or non-air mix, total amount of ready-mix ordered, contact person, concrete mix ID number, and the purpose of the concrete. Finally, inform the concrete batch plant the conditions of where the ready mix will be placed (slope, incline roof, limited space, basement, roof) or any relevant information that could affect the schedule of the pour. Understanding Concrete Saw Cuts: Why, Where to Cut, and How Deep? Why Builders Recommend Using Concrete Siding? Cost, Benefits or Both?